The story of tea begins on a summer day some 4,700 years ago when Emperor Shen Nong and his imperial entourage paused during a long journey to refresh themselves. Shen Nong, considered the father of Chinese herbal medicine, had declared all drinking water be boiled and, while the water heated this day, some dried leaves from a nearby bush fell in and infused the water, turning it slightly brown. His scientific curiousity prompted Shen Nong to drink the liquid and he found the drink very refreshing. That first cup of tea started a tradition that became part of social cultures, built fortunes, and changed empires; it is definitely still with us today. Tea has gone in and out of fashion as people have enjoyed other drinks socially, such as coffee and cocktails, but tea today seems to be here to stay. With a society that is more health conscience than ever, tea is not just back in style, it is taking over! In almost every trendy neighborhood you will now find a tea house, where the menu boasts pages and pages of interesting brews along with some light and often healthy fare. Tea rooms are the modern answer to the classic tea parties. However classic they might be, they are still quite alive and kicking. You may not think of tea parties as being seasonal, but judging by the number of inquiries we have been getting lately for tea parties, tea party season is definitely upon us! A tea party is perfect for a fundraiser, a baby shower, a bridal shower, a luncheon, a graduation celebration, a little girl's birthday party, and many more special events. It can be casual, elegant, or anything in between. Make it fun by adding an Alice and Wonderland theme, or classic by modeling it after a traditional English high tea. No matter which direction you choose to go with your tea party, the food is always a hit. The key is bite-sized finger foods, and you guessed it...that's our specialty! Most traditionally, the menu would consist of little tea sandwiches and scones with various fruit spreads. Small cakes, canapes, and baskets of fruit will add to the menu and make a beautiful display. 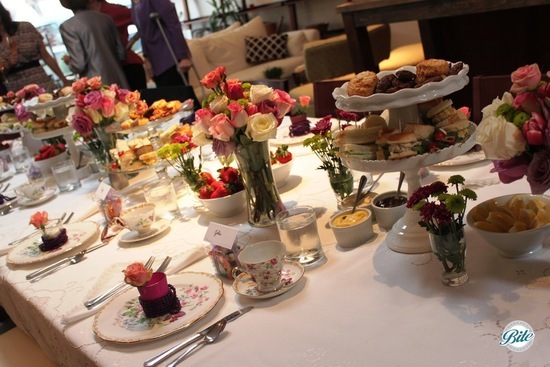 Tea parties can be formatted by offering individual table service, and setting up a small display on each table, or by creating one buffet, or food display, and a seperate drink display. Let's see, what beverages shall you serve? How about tea! It is nice to offer hot tea and iced tea, and a variety of blends giving your guests plenty of options. There are Black, Green, White, Herbal teas, full-leaf and tea-bag just to name a few of the categories. For an elegant touch, use a clear glass pot to brew one of the flowering blossom types of tea - made of specially tied tea leaves that "bloom" in the pot as the tea infuses. There may be people at your tea party who do not drink tea, so one or two non-tea options is recommended, such as lemonade or champagne. Here is Bite's newly released Tea Party Catering Menu. We are more than happy to customize this menu to fit your exact taste and/or budget. Happy Tea Time!